Beau Robinson is a 6-foot-1 190 pound do-everything back who made a commitment over the weekend to play for the Cougars (Class of 2018). Robinson preps at Mountain Crest High School (Hyrum, Utah), where as a senior he played wide receiver, running back, kick returner, and outside linebacker. He had 162 carries for 739 yards (4.6 avg) and seven touchdowns. He also had 42 receptions for another 729 yards (17.4 avg) and eight touchdowns. On defense he had 50 solo tackles, including six tackles for loss and four sacks, with four quarterback hurries, six pass deflections, and two interceptions. 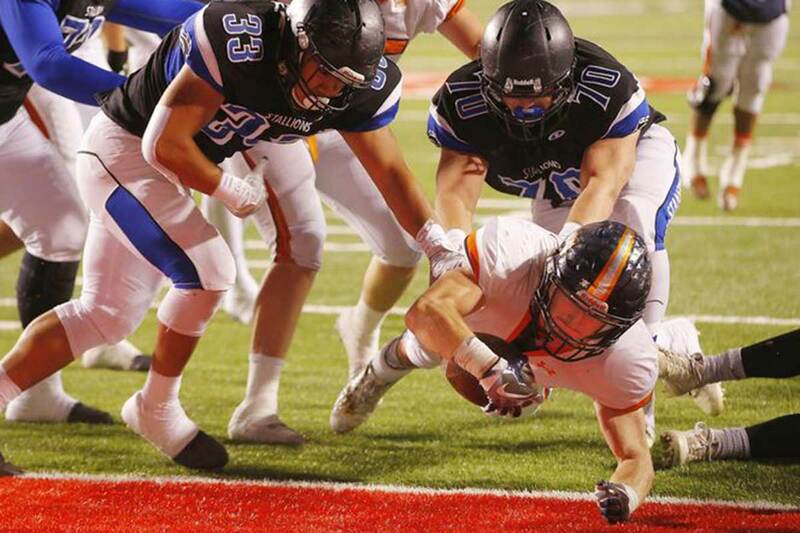 He helped lead the mustangs to the Utah state 4A title game where he had 46 rushing yards, three receptions, and three sacks. Robinson has seen recruiting interest from Adams State, Snow College, and Southern Utah University. He will join BYU as a preferred walk-on. Class: 2018 HT/WT: 6’1”, 190 lbs. Robinson: It has always been a dream, one that I wouldn’t pass up. BYU is a good fit for me because it is a place where I can be surrounded by people who believe in the same things as I do. It’s a place where I can learn and stretch as a person and player. Robinson: Game day. BYU plays in so many big venues, it’s hard not to be excited for that aspect of football. Robinson: Forrest Gump, Second Hand Lions, Rudy, the Percy Jackson book series, country music, and Fruity Pebbles. I also love to read the Book or Mormon, which is awesome because it’s required reading at BYU. Robinson: Playing in the 4A state championship game. What a blessing it has been to get to that stage. My junior and senior year were nothing but the best. Robinson: Just that I’m excited to be a part of such a great campus! Go Cougs!